Golden Grimoire is one of NetEnt’s titles, and it’s offered as a magic themed title, one designed at fairly high quality. NetEnt has a long history of releasing excellent slot machines, particularly when it comes to the experience that’s offered and the quality of the design. 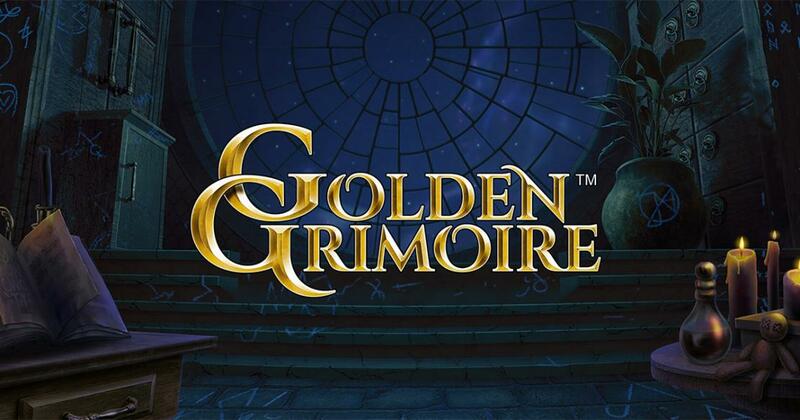 While you can see the quality in Golden Grimoire as well, I didn’t find this particular release as interesting as some of those launched in the past. It might be the choice of symbols that takes it down a notch for me, since the slot relies on a mix of jewelry pieces and card suits for its line-up. It doesn’t have enough connection to its magic theme, even though in the background you see a wizard’s lair, with potions, lit candles and spell books sitting around. Overall, an above average design quality wise, but it’s below average if you compare it with the rest of the NetEnt collection. You are playing on 5×4 reels in Golden Grimoire, and you’re getting 40 lines in exchange for your bets. With an RTP of 96.44% and a top jackpot of $40,000, it feels like it should be a low to medium volatility release, since it pays only 100x the stake. While you get 40 lines from the game, your wagers are only required to use 20 coins, or multiples of that number. You wager with 20 to 200 coins, depending on the bet level, and you have a coin denomination of $2 at most. This allows the betting range to go from $0.20 to $400. Mystery Spell Books may land on the last three columns. Those icons will be turned into a single randomly picked symbol, which can be a wild, a medium or a low paying position. You can get wilds here only as a result of the Mystery symbols transforming, so don’t count on them showing up too often. The symbols found to the left of the mystery symbol will also be turned into wilds, for that round, all the way up to the 1st reel. For the final feature, we get 8 free spins, which trigger when three scatters appear on the reels 1, 3 and 5. Sticky Mystery Symbols will be the extra feature available here. Golden Grimoire has some decent features to offer, but I’m not at all happy about the 100x the stake payouts that are promised, even with the good RTP.